This nice 20 acre parcel is as private as it gets. This parcel features a 14’x16’ shed or guest quarters unit, a 4’’ well and a septic system rated for a 4 bedroom home, and a travel trailer that was damaged in a recent storm. Deer, elk and more wildlife call this parcel home and there is state land directly across the road. The property is approximately 2.5 miles off Molineaux Road and 20 minutes from I-75. This double lot with 140’ of water frontage on Wildwood Lake’s west shore is the perfect place to build your dream home. Wildwood Lake is a 222 acre all sports lake where you are able to enjoy fishing, boating, and swimming activities. This listing also includes an additional building sit across Valley Road for storage or construction of a garage or pole building. The opportunity to purchase 1 vacant waterfront lot for $65,000. can be considered. This outstanding 66.73 acreage parcel located just south of Wolverine with approximately 1600’ linear of frontage on the Sturgeon River actually owns both sides of the river making it nearly 3200’ of frontage! Bordering the Rails to Trails path on the west and I-75 to the east, this property has great variation. 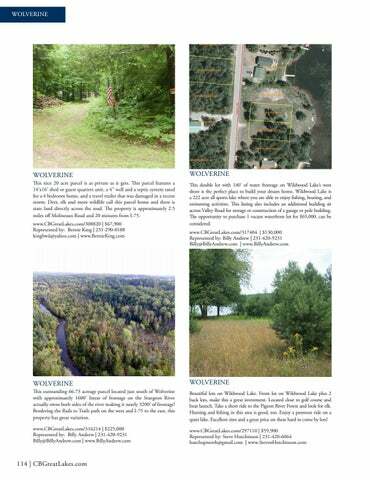 Beautiful lots on Wildwood Lake. Front lot on Wildwood Lake plus 2 back lots, make this a great investment. Located close to golf course and boat launch. Take a short ride to the Pigeon River Forest and look for elk. Hunting and fishing in this area is good, too. Enjoy a pontoon ride on a quiet lake. Excellent sites and a great price on these hard to come by lots!